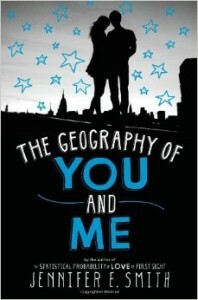 The book The Geography of You and Me is another decent novel by Jennifer E. Smith, which I mostly enjoyed, but had a some parts that I did not enjoy. For people who like an over-the-top descriptive novel with the point of view of two different characters, than this is just the right novel for your liking. Lucy and Owen met in an elevator, stuck due to the city-wide power outage, in between two floors of the tall Manhattan skyscraper. After they are rescued by management, Lucy and Owen spend the rest of the night walking around the darkening streets. When the power is back and school starts up again, the magic from the Night of the Blackout fades. Lucy moves to Edinburgh and starts seeing another boy, and Owen drives out West with his father, and meets a beautiful girl in Tahoe. Although they know they shouldn’t, Lucy thinks about Owen and Owen thinks about Lucy. Can fate intervene to reunite them once more? For people who like a book with heartbreak, separation, and very descriptive situations, this is your type of book. I thought Smith was a little over descriptive and put in some details that were not necessary and made the book more boring. The beginning and the end where pleasing, but the whole middle of the book was genuinely dull and unenjoyable. Other than this, the book slightly interested me, but I still found it humdrum, because it was very repetitive. Lucy moves, Owen tries to find her, but then Owen moves before he can find Lucy. Than Lucy starts looking for where she can find Owen, and they finally meet up but something happens and they lose each other again, and the same situation over and over. The ending was also very predictable. All in all, the book was mostly enjoyable, but a lot of the novel was uninteresting. I felt like I could put the book down, it did not interest me as much as other books I have read. In conclusion, this book is recommended to people enjoy books with over-detailed situations and characters, but otherwise the novel was a bit of a disappointment.